Riona Fitzpatrick’s career in IT started with a chance conversation. After doing her A-levels at Thornhill College, she was planning to study Communications, Advertising and Marketing at Ulster University. “Have you ever thought about doing Computer Science?” asked a woman Riona bumped into while walking down the university corridor. Before she left the building, she’d talked to the course director, pulled out of the CAM course and signed up for a Computer Science degree. Up to that point her biggest exposure to IT had been printing a word-processed document: “the school computer room wasn’t a place that was particularly promoted”. Starting the degree course as a total novice, she finished it four years later with first class honours and a job in BT’s software centre in Belfast where she had completed her placement year. “I started out as a software developer and then a test team leader. I know how to develop, I know how test, I might not know how to do it today, I’d be a bit rusty like quite a few of us, but I got a chance to go through the entire software journey. Hands on stuff and a really good foundation for the roles that would come later. Another significant pivot in Riona’s career was her shift to work as a Business Operations Manager, sitting around the table with finance directors working for the CFO in BT’s IT unit. Getting experience in a broad range of areas has been “huge” says Riona. Involvement in business unit reviews taught her “how BT works and how it all ties together” and brought her into daily contact with senior managers. Today Riona is Director of Global Client Service Operations. 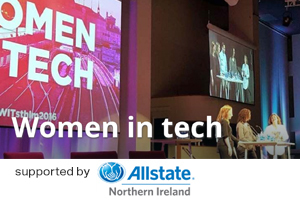 Based in Belfast, she sits in the CIO organisation between the Technology, Services and Operations unit and the customer-facing Global Services line of business. “I work with Client Services Teams all over the world. Sales teams work with customers to promote and sell our portfolio of global products, everything from networks, dynamic network services, security services and collaboration technology like One Cloud Cisco that I’m focussing on at the moment. When the deal is signed, Client Services Teams deliver the services to the customers around the world. As her career has progressed, Riona has never been conscious of a glass ceiling in BT or a lack of opportunities for women. But she admits that “it’s obvious that we need more females in this industry”. One of her current mentors is Rachel Higham, Managing Director of IT, and the winner of Mentor Of The Year at the 2017 Women Of The Future Awards. Since joining BT in 2015 Rachel has set up the BT Tech Women Network to address the internal statistics which showed more women were leaving at the junior to middle management and middle to senior management transitions than were joining, and challenged the effectiveness of existing diversity and inclusion initiatives. Riona looks back at her younger self and admits “I didn’t actually realize what a career in STEM would look like. I wish that someone had come along to school and told us more about a tech or a STEM-related career.” She applauds the latest STEM Supplementpublished by Catalyst Inc.
She has participated in Not Just For Boys events and supports the BT Young Scientist & Technology Exhibition in Dublin each January where Belfast-based BT technology graduates mount a stand to “showcase the world of opportunities for a tech career in BT to the next generation”. Riona’s BT journey has so far taken her to 24 different cities around the world, and places her in daily contact with staff dotted around the globe working to design and deliver cutting-edge services for customers.